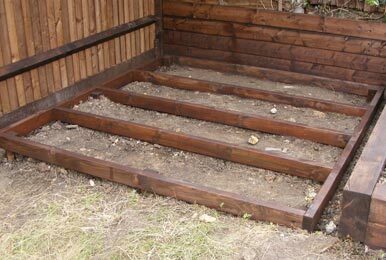 It is crucial to provide a level and dry foundation for any garden building to sit on. It is virtually impossible to erect any building on uneven ground as screw holes connecting the wall panels will not line up. For larger buildings especially where the shed is to be used as a workshop a full concrete base is best. Base can be made from timber, concrete or slabs. We offer a full design, supply and installion service on all types of bases.